Last night on The Ultimate Fighter, team coach and contender for the light heavyweight championship Chael Sonnen put even more distance between himself and second place in the race to be the most compelling personality in MMA. As he has all season, Sonnen dropped his goading, couplet-rhyming, master-of-self-promotion shtick while in the gym. His advice to his fighters throughout the season has been supportive and decent, even vulnerable. At times it’s even tended toward the philosophical. Last night was such an occasion. Now, ask William James, the American philosopher and pioneering psychologist, or even a recovering alcoholic who’s been through AA, and they’ll tell you the phrase goes something more like “You can’t think your way to right action; you can only act your way to right thinking.” But whether the author of the New Yorker piece misinterpreted what Milch was saying or whether Milch was having a little bit of literary fun with what he admits is just a “highfalutin’ expression” doesn’t matter. What matters is that he and Chael Sonnen are right: Whether you’re a writer or a fighter, planning is all well and good, but you won’t know how well you swim until you jump off a bridge. As a writer and part-time MMA punching bag myself, I can only attest in my small way that the bridges are equally high and the waters equally perilous. 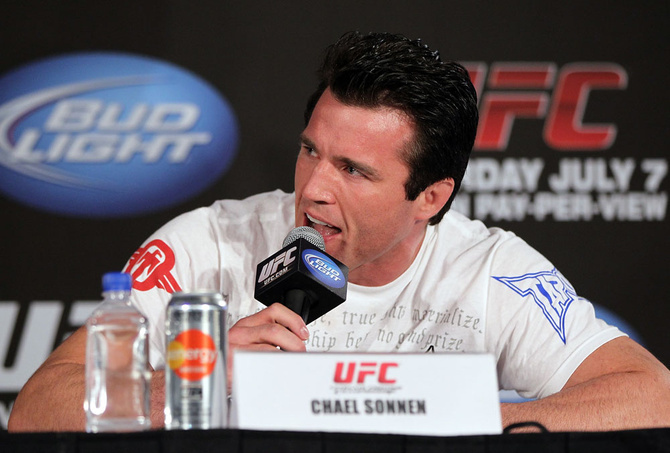 Anyway, for those keeping score, in the past few years we’ve had Chael Sonnen as P.T. Barnum, Chael Sonnen as Muhammad Ali, and Chael Sonnen as Charlie Kaufmann. Now we have Chael Sonnen as William James, or at least David Milch, or at least an Alcoholics Anonymous pamphlet. Either way, just be thankful we no longer have Chael Sonnen as Generic Fighter X, who is on display in this old Bodog Fight video from 2007. Skip to 9:18 to see how far Sonnen has come. Thank god.